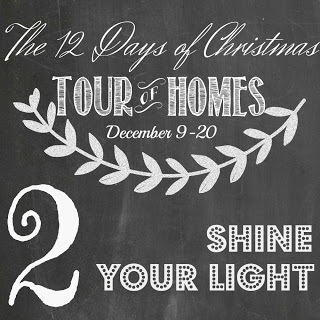 Yesterday Jenny kicked off The 12 Days Tours. Did you visit her gorgeous home? Since we moved here three years ago, I have simplified my Christmas decor in a big way. Besides the decorations for our tree, I mostly use fresh greens here, there and everywhere! 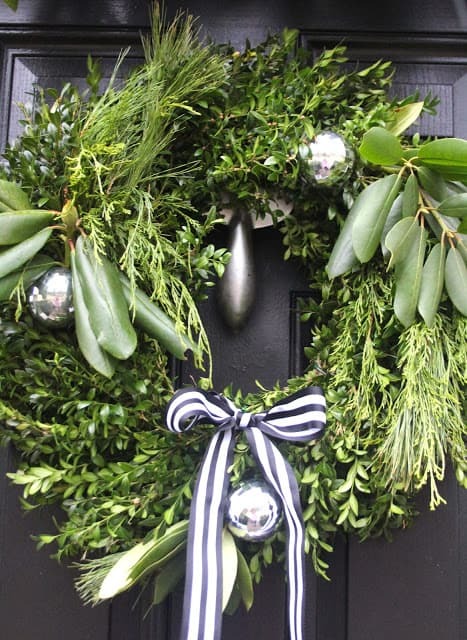 This boxwood wreath is from Trader Joe’s and I added a few clippings from my yard. I hung our fur-ified stockings on the stairs in the foyer this year, because we use our fireplace all the time and are constantly taking them down when we hang them on the mantel. One of my favorite parts of the Christmas season is going to mailbox and finding cards from friends and family – do you love it too?? I hang them on ribbon on all the doors in our foyer so we can enjoy them every day. By Christmas all the doors will be covered. We also put ribbon and mini-clothespins to work on our random acts of kindness advent calendar that I hung on the stairwell to the basement. How about a cup of hot cocoa, or perhaps a fun Christmas cocktail? How many mirrors in one room is too many, do you think? Presently the living room has FOUR, and I LOVE how they reflect the Christmas tree lights! 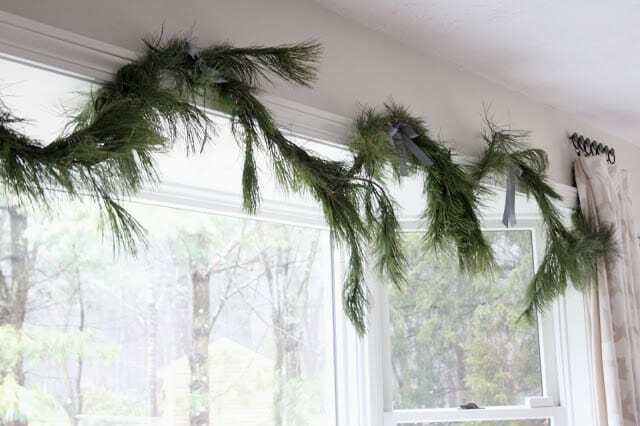 I hung simple pine garlands in our dining room bay windows. I love to hang our own Christmas cards from year to year and see how my own babies have grown and changed! This wooden toolbox was made for my husband by his great uncle, Arthur. He’s 95 now and one of the funniest and kindest people ever – we all love him so. Long ago I confiscated the toolbox for decorating purposes and this year it’s storing all my gift wrap supplies in a corner of the dining room. The kitchen window and slider got festified too. The family room fireplace is a work in progress. We spend a lot of time in here, watching The Voice with a fire going. 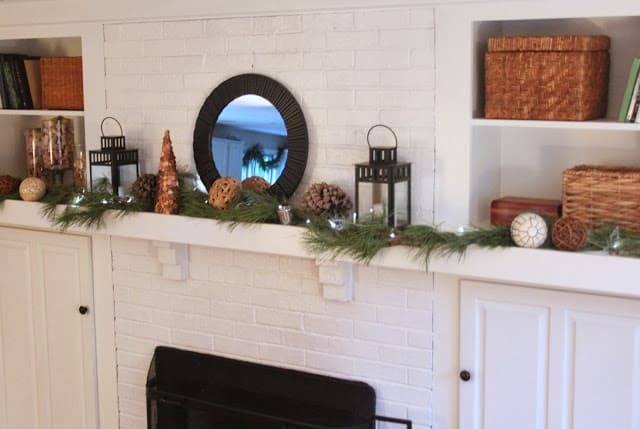 I’ve been daydreaming of a round mirror for our mantle forever. I found this little baby one last week and if I get my act together you might see a little makeover action in the near future! The penny tree is a new addition which I’ll share with you soon. 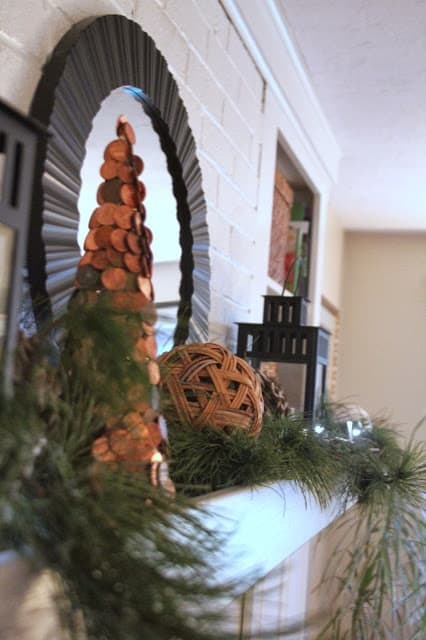 I love how it shimmers when the mantle lights are on. to unpack every Christmas decoration we own, to deck every room in our house, to have my Christmas cards ordered, addressed, and mailed by December first, to have all the gifts bought and wrapped and under the tree all beautiful. All those things are wonderful, unless you start to feel cranky and overwhelmed and underappreciated. and let’s be honest, NO ONE wants to be around a mom who is cranky and overwhelmed. So – this was the year I started delegating. Mark put the lights on the tree and the kids decorated it, while I enjoyed it all from under a blanket on the couch. 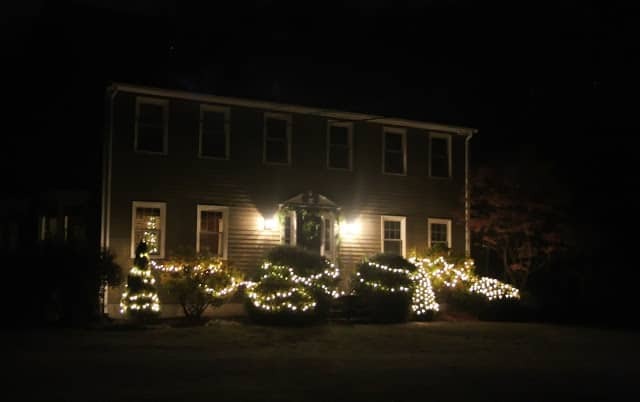 I also gave the task of the outdoor lights to my 15 year old son, Peter. I told him – do whatever you like. It’s your design! Giving, making time to visit with family and friends, enjoying the sights and sounds and smells of Christmas, and most importantly, celebrating the real reason of the season….that is what it’s all about! Whether your home is simply or spectacularly decorated for the holidays, I hope that you soak it all in, and enjoy this season of light! Thank you for taking a few minutes to visit our humble abode! Merry Christmas and cheers to a happy year ahead!! 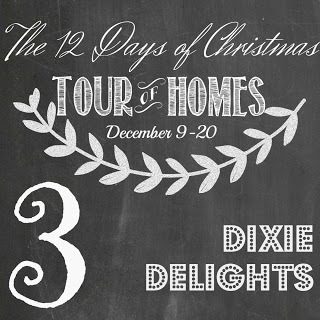 Tomorrow on the Tour of Homes, don’t miss the stunning southern home of Amanda at Dixie Delights!!! 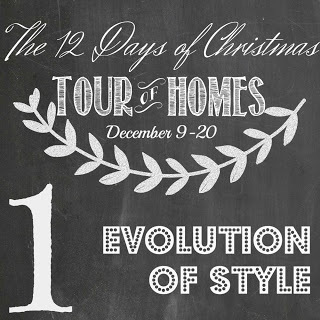 On The Twelfth Day Of Christmas….We Had A Party!!!!!!! Lovely Lisa!! 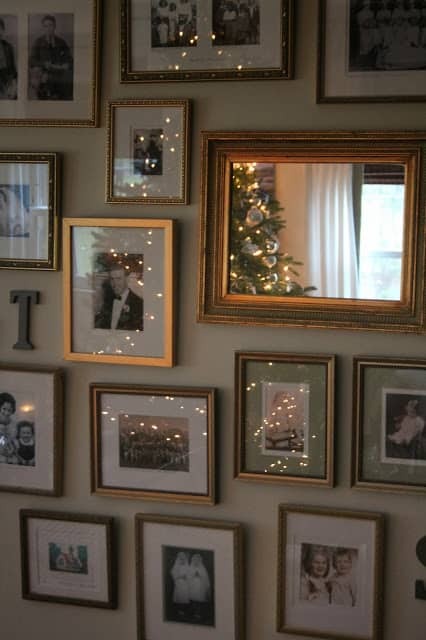 I love the idea of hanging your own families Christmas photos from years past!! I have NO idea where ours might be??? Everything looks beautiful! Wishing you & yours a happy holiday! Lisa, your home looks SO great! So many great touches I don't know where to start. Very inspirational. Your home looks beautiful my friend. And I love all of the special items that you have that remind you of years past. And amen to your theory on prepping for Christmas this year. Love it!! I would so love to take you up on your offer of the Christmas cocktail because that room looks so wonderfully warm, cozy, and Christmasy! 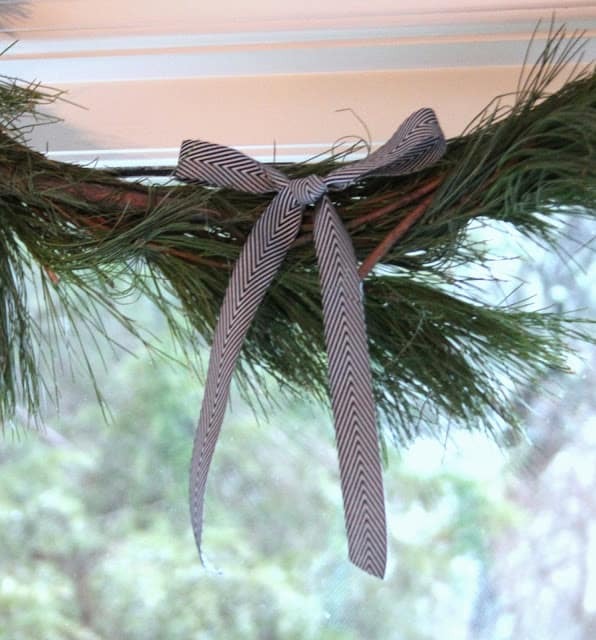 I'm going to steal your idea of the garland with cards along the bay window next year – love that! I'm with you about keeping everything simple this year – I've done the same thing. 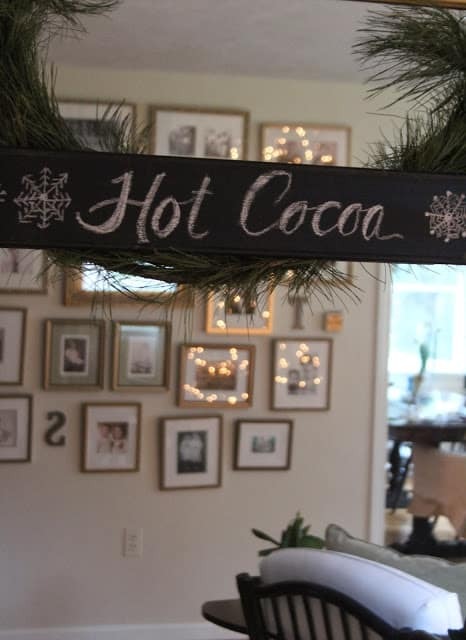 We also had a cocoa bar for the first time this year – my kids LOVE it, don't yours?! Thanks for sharing your home with us! 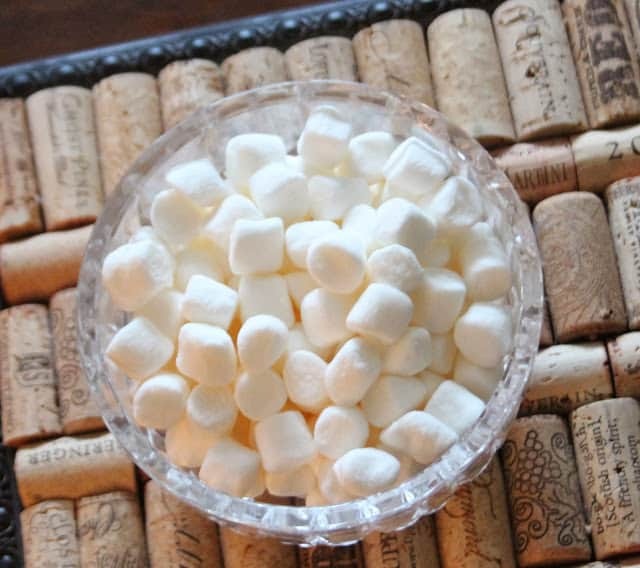 I'll be right over to enjoy your hot cocoa bar! Everything looks gorgeous, Lisa. It's just the right amount in my opinion! Beautiful job! I mentioned your heartwarming post on my blog today. Thanks for all you do! I can feel the warmth and love in your home right through my computer screen, what a lovely tour, my friend!!! I love your simple, yet beautifully classic style this year and kudos to your family for their part! Love your stylish wrapping set-up in the tool box, too! 🙂 Go enjoy!! Lisa, your house looks beautiful! I feel warmed and welcomed, all the way out here in the blogosphere! 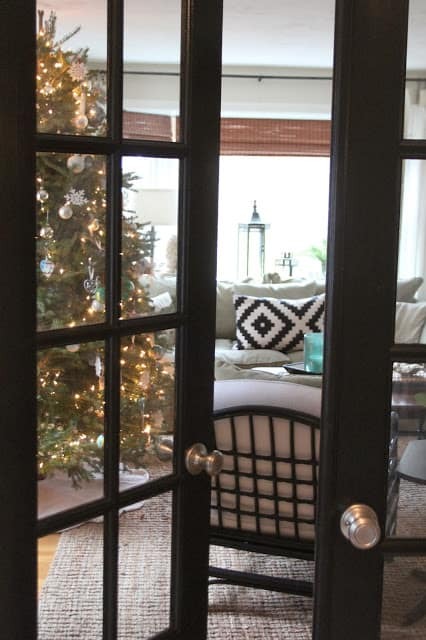 I love your front door wreath and the black and white ribbon you used throughout, and your tree is to die for. And don't you love putting family pieces to use in some way, shape or form? Your great uncle's tool box warms my heart. Thanks so much for sharing! Everything is gorgeous Lisa!!! 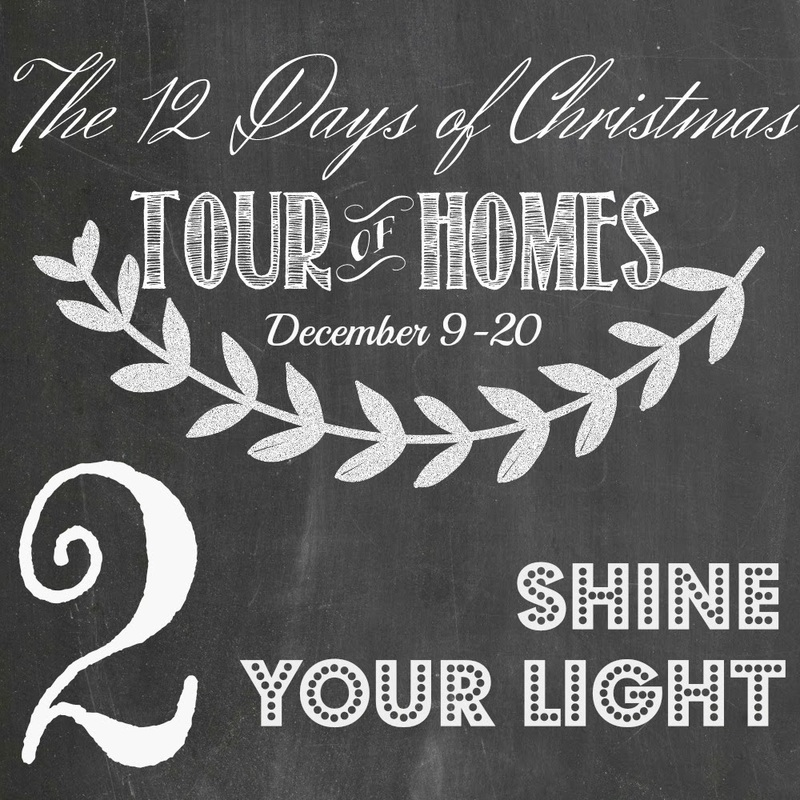 Your home is always so warm and inviting but especially during christmas! Beautiful job. lisa, it's beautiful! i love your tree and love all the natural and black and white mixed! classically beautiful!!! 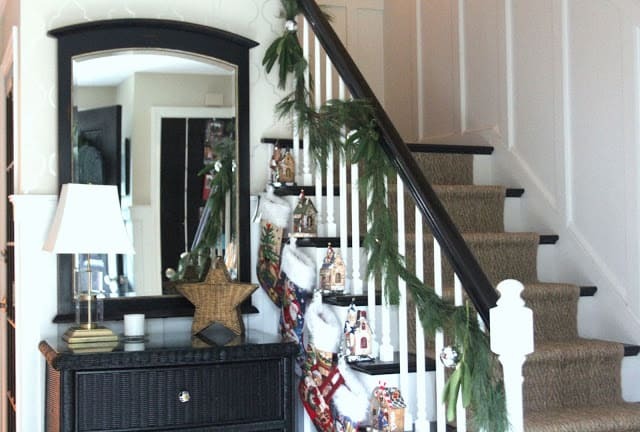 Your home looks more beautiful with all the Christmas decorations Lisa!!!! 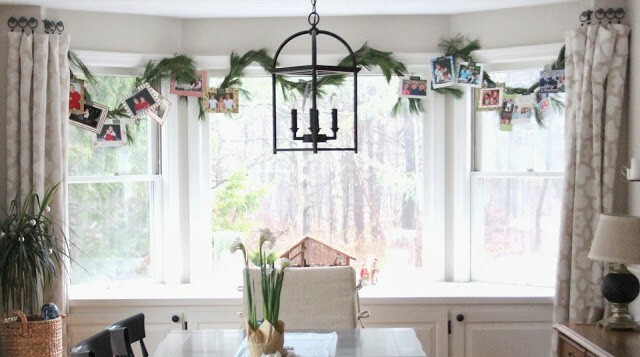 In love with the garland with all your holiday photos from years past! 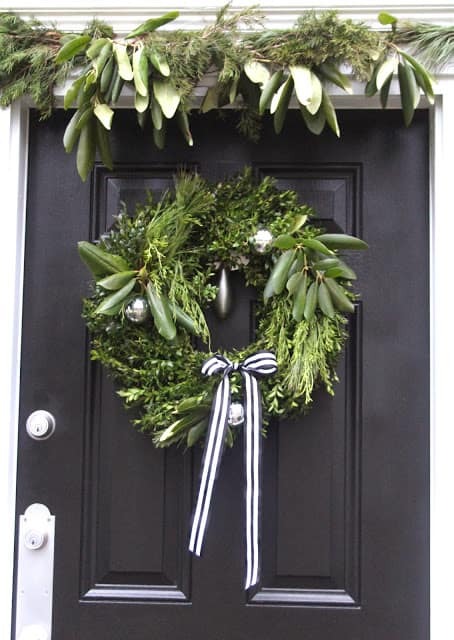 Your front door is just really chic with all the green and black & white ribbon! 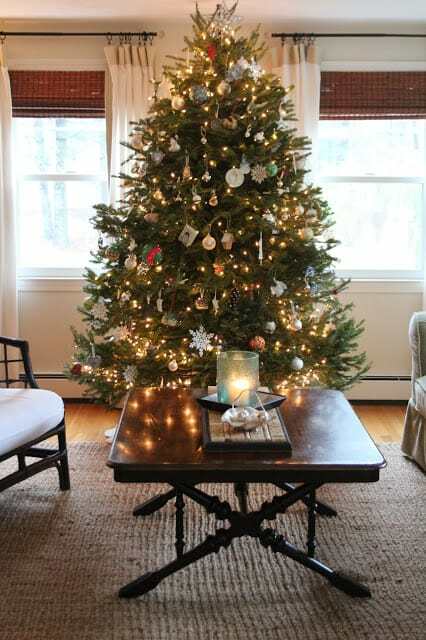 I love your living room, so inviting and tree equally gorgeous! I'm just like you, LOVE giving and receiving Christmas cards! Enjoyed the tour immensely! Hi lisa. What a beautiful festive home. Love all your touches especially that penny tree.amazing. happy holidays! Beautiful, Lisa! And I agree, if we're stressed and cranky, then what's the point. Well said. 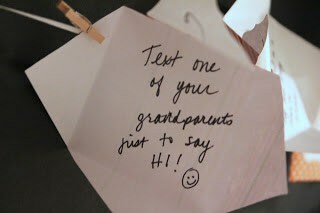 Love the random acts of kindness idea!! I was thinking about moving my stockings to the stairs and you just sealed the deal! Thanks for the inspiration. All the best to you and your family! So so pretty, Lisa! 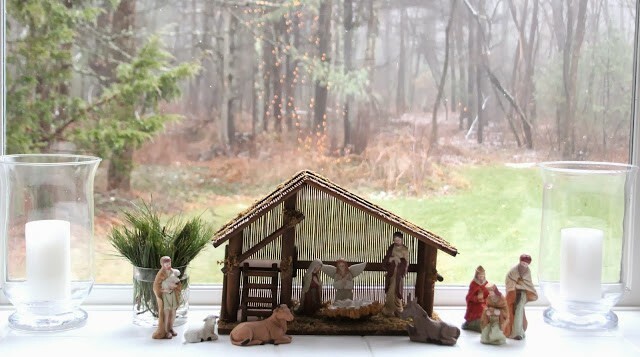 I share your Christmas decorating philosophy, and I love that you delegated. Your son did do a great job!! 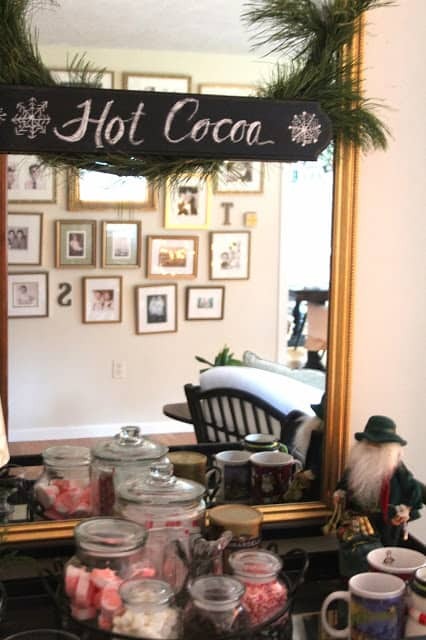 My kids would go crazy over the hot cocoa station 🙂 Hope you have a very Merry Christmas!! Lisa, your home looks beautiful! I love your tree and all the greens around the house. It's so nice that the kids can help out. It makes it extra special for them too. Enjoy your family time this holiday! Everything is beautiful, Lisa. Love all your natural greens. Wow Lisa! 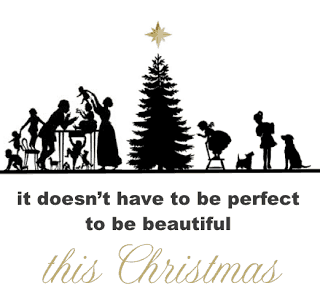 Your home and Christmas decor are absolutely stunning! 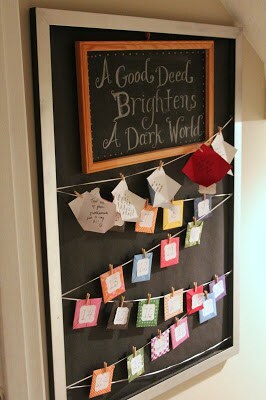 So many fantastic ideas and I love the idea of working the cards into the garland! So smart. I just love all your little touches! Thank you so much for sharing your home and your Christmas ideas!! Very pretty, Lisa! I love that wall of photos in the pretty frames. Thanks for sharing your Christmas home. You and your family did a beautiful job. I love all the natural elements. It's really simple and classy. 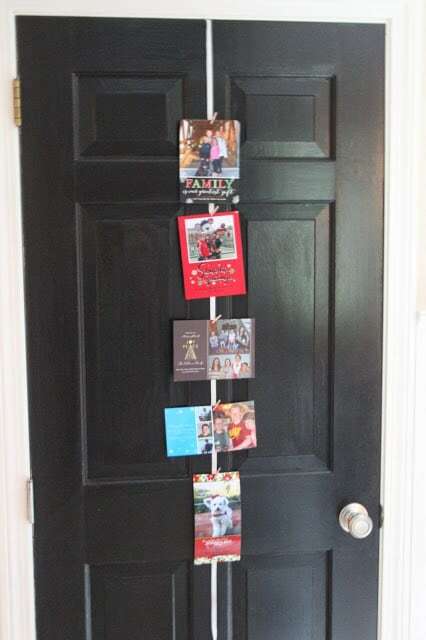 I also love the idea of displaying your past Christmas cards. So sweet. By the way, I think that mirror you have is the same one I bought for my girls' room. I ended up painting it. Can't wait to see what you do with it. I love all of your natural elements! Your house is just gourg! 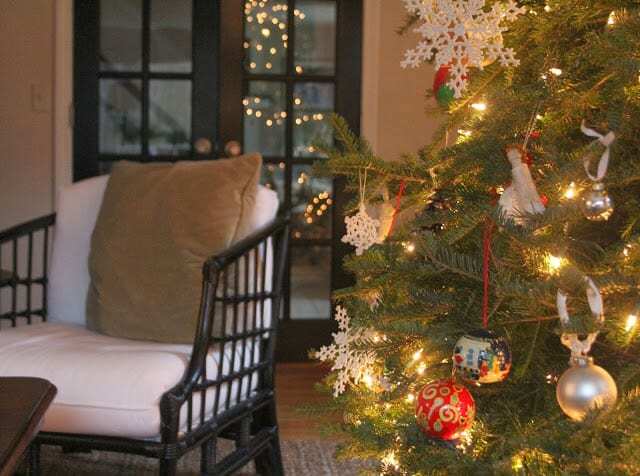 Your house reflects who you are and you have taken your family's help in decorating this year which is so special. Everything looks great, Lisa! Love mirrors, cannot use enough of them, and all the special touches. Beautiful! Your tree looks amazing. Merry Christmas to you and your family! So lovely, Lisa!! What a cozy and comfy home! Maybe ill just drive the wreath up there and have a cocktail with you! Love your use of real greens. I am a new follower and best bud of Amanda at Dixie Delights. Hope you check out Uptown Acorn. Lisa, Your home looks lovely! 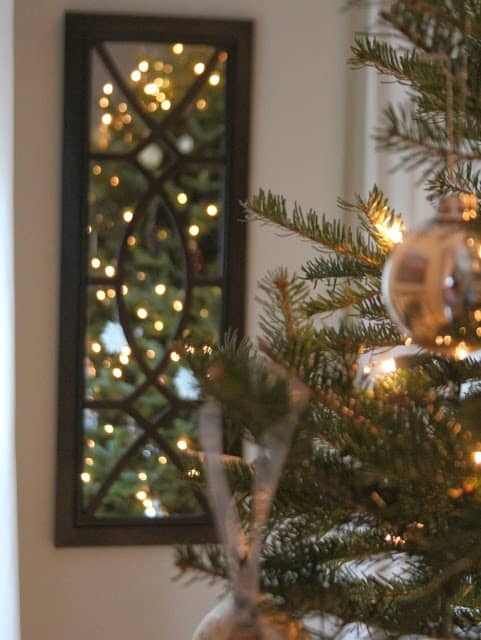 You have a great gallery wall, and I love how you can see the reflection of your tree in the mirror. Enjoy the holidays! The word magical comes to mind as I peruse these pictures! Love, love! Beautifully done! Stopping by from Little Black Door. Your home looks lovely, Lisa! 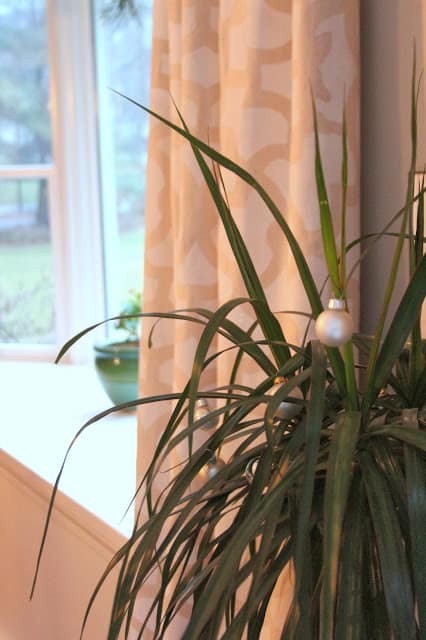 I love that you use so many natural elements in your holiday decor. And I'm a total mirror hog myself! Merry christmas!! Wait, did I not leave a comment here?!? So sorry! I loved your gorgeous tour yesterday and drooled over every photo. Your fresh greenery is so pretty! And, how good do those gorgeous black doors look with everything? Awesome job, Lisa! 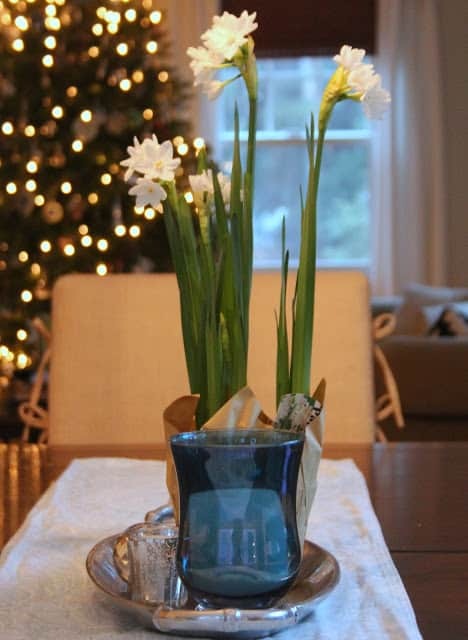 Love the simplified Holiday decor you have put together. It is rich and beautiful, especially since so many things were done by delegating. I have never thought to display my family's holiday card and will have to do that. And I love your random acts of kindness advent calendar. Enjoy this time with you family and friends Lisa!!!! 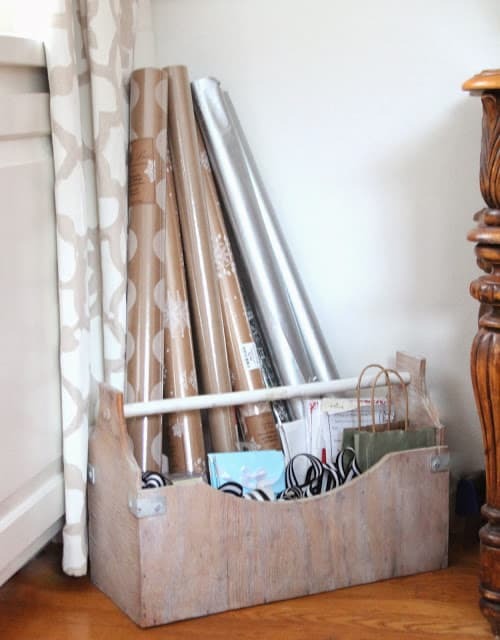 Love the idea of leaving the wrapping paper out and arranging in an attractive bin! I think I will do that at my house. Great idea. Hi Lisa, this is so pretty! I am in love with all the black and white ribbons added. Your door looks amazing. Can I borrow some wrapping paper :). Such a pretty home. Love everything! Merry Christmas Lisa! 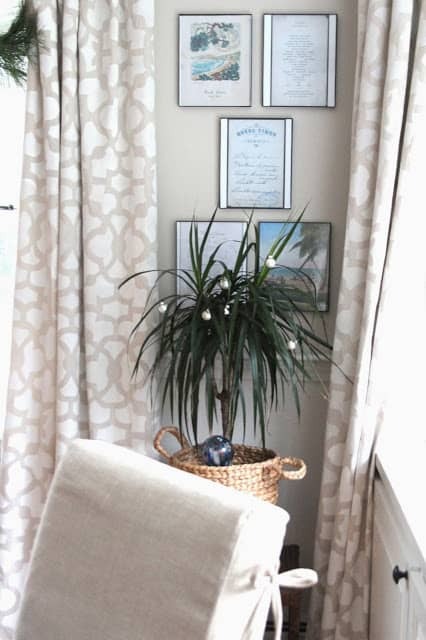 I just love the way you used fresh greens througout your house and your home is just beautiful–very much my style. Love everything about this! 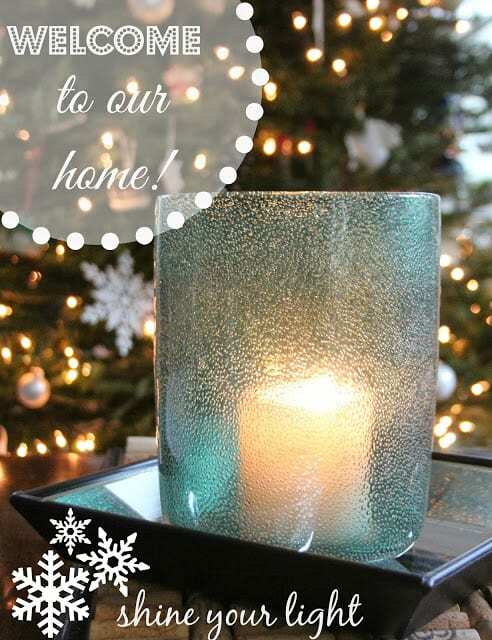 Your gorgeous home looks so spectacular at the holidays! 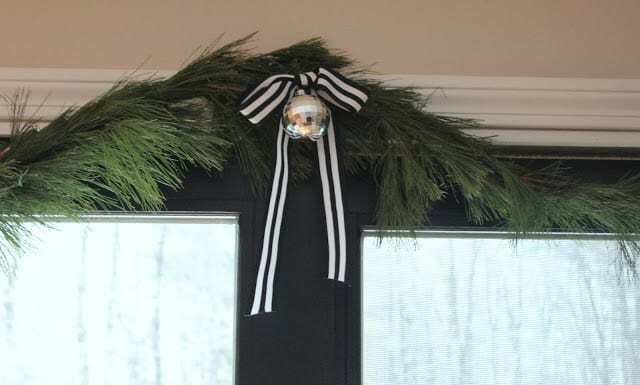 I love all the simple black and white ribbon you used in your decor and all the lovely greens. Hope you are enjoying the season. Merry Christmas! it's about people and love.